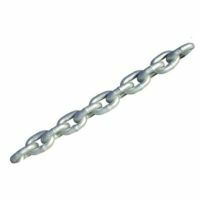 In this category you will find our galvanised calibrated boat anchor chain. We supply this in 6mm, 8mm and 10mm in various lengths. In this category you will find our anchor retrieval system. 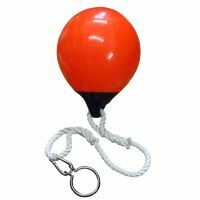 These are Polyform buoy's complete with nylon rope, carbine snap hook and anchor rings with eyes. We supply lead anchor ropes and also 3-strand nylon anchor ropes in various size diameters and lengths. One end has a spliced stainless steel thimble, the other a soft eye splice. Manufactured using highly sophisticated extrusion technology and twisting machines. All our Gold Strand baler twines are manufactured from a single tape, using only the highest quality raw materials. This guarantees a precise & uniform twist in the twine. Queuing systems, often referred to as 'barriers' or 'barrier stands' are among those products whose integrity is vital & yet at the same time taken completely for granted. These familiar objects are expected to undertake their function day in, day out with high levels of reliability & without presenting a source of danger to the public at large, whose close proximity is consistent & often difficult to monitor. Our queuing systems have been painstakingly developed to meet these criteria. 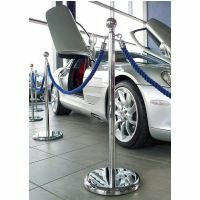 They are carefully manufactured in the UK & offered with a choice of high quality standard finishes, or customised to match your corporate requirements. In this section you will find out Fitness Ropes. 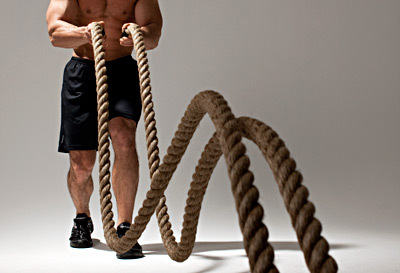 Fitness Ropes are also known as Undulating Ropes, Power Ropes, Training Ropes, Exercise Ropes and Conditioning Ropes. These Ropes are an excellent tool to improve your overall fitness and are becoming extremely popular. We offer two types of ropes in a wide range of diameters & lengths. 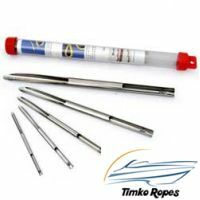 In this section you will find our great offers that we have on our ready made boat anchor kits. 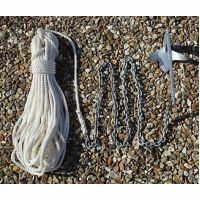 These packages include your desired anchor, white 3-strand nylon rope spliced onto galvanised short link chain complete with stainless steel jaw/jaw anchor swivel. Which ever boat anchor you require we have it here. We have a huge selection of boat anchors including Bruce style, Plough/CQR style, Danforth style & Folding anchors to suit all budgets. The Basic rules of a good anchoring system Never overlook the importance of every element in your anchoring system : it is only by selecting top quality elements & assembling them correctly together that you obtain a perfectly reliable anchoring. Chain Diameter must be generous & length at least 5 times the boat length (See table) Rope Opt for polyamide/nylon, which provides good abrasion & tension resistance, with a good stretching capacity (18 to 25%) to absorb the surges that waves impact on the anchor. Bungee Shock cord supplied in a range of colour and diameters. Here is where you'll find our range of cargo nets. We produce 3 different kinds of cargo nets made from top quality 3-strand polypropylene rope. Cotton is a soft, staple fibre that grows in a form know as a boll around the seeds of the cotton plant. It is a lightweight soft 3-strand rope that is ofter used for decovative purposes. Cotton rope is very stretchy and is extremley comfortable to handle. It can also be easily dyed. 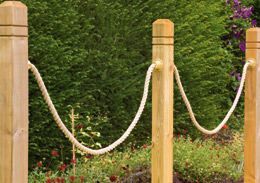 Make your garden look fantastic with our decking and garden ropes. We supply decking rope by the metre or coil in manila, hempex, polyhemp & sisal all at discount prices. We stock it in 20mm, 24mm, 32mm & 36mm diameters at low low prices. 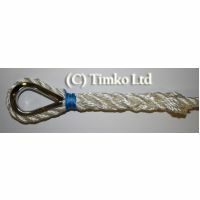 Here at Timko Ltd we supply a huge range of decking rope end fittings and fixings suitable for all our natural fibre rope such as manila and sisal and also our synthetic hemp rope. We supply these in chrome, satin silver, brass and matt black suitable for all our 24mm, 28mm, 32mm and 36mm decking rope. The decking rope fittings that we stock are rope cup ends, rope handrail brackets, rope hook ends and rope hook eye plates. In this section you will find our ready spliced nylon double braid dock lines. 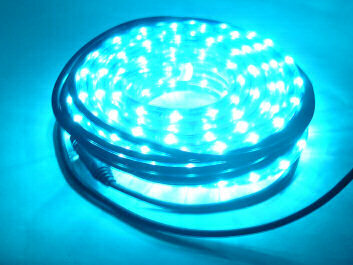 We supply these in 4 different colours to match the interior decor or hull of your boat. In this section you will find our fender ropes/lines/lanyards. Our fender ropes/lines are made from a variety of ropes. These include top quality 3-strand polyester rope available in white, black & blue all ready spliced with a 4" soft eye one end and heat sealed the other. These are available in 1.5m lengths either in a pack of 4 or a pack of 10. 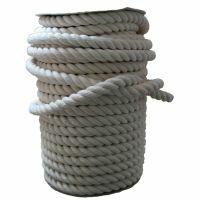 We also stock our fender ropes in a 16-strand braided polyester rope which are available in white, black & blue. These have a 4" ready spliced soft eye one end and are heat sealed the other end. These are also hand wipped and sewn at the throat and bitter end of the rope. These are available in 1.5m lengths either in a pack of 4 or a pack of 10. Hand carved in the UK from Green oak, this beautiful wood garden swing will look amazing in anybody's garden. The green oak is chosen for it's longevity & ease of maintenance and will age beautifully if left outside, naturally silvering over time & may even cup or twist slightly, which will add to its unique character. The standard or 'uncarved' swing has a natural plain finish but we also offer a version with the phrase 'Just a Bit of Fun' carved into the facia. Available in 3 kits depending on the diameter of your bough. This swing is superbly engineered and is very straight-forward to install. All you need to do is chose a bough that is strong enough & level & between 8 feet or 2.5 metres & 15 feet or 5 metres from the ground, then loop the spliced hempex rope around it. The seat itself is supplied with 2 x 5 metre lengths of Hempex rope which is spliced & securely knotted-off under either side of the seat. You then simply thread the ends of each of these 5 metre lengths through the open loop hanging down from each of your bough loops & double it back on itself. Next, you level-up your seat & secure the lengths by tightening the heavy duty metal clamps (2 for each rope) & cut-off any excess rope and heat seal the rope ends with a lighter to seal them & to stop them from fraying. In this section you will find our Gym Ropes. 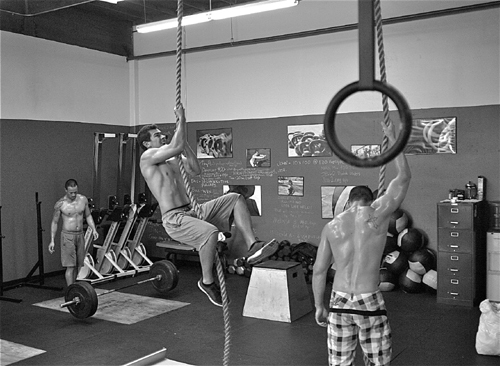 Our Gym Ropes are made out of either 3-strand Polyhemp Rope or 4-strand Natural Hemp Rope. They are available in 28mm, 32mm & 36mm in polyhemp rope and 28mm & 36mm in the Natural Hemp Rope. They are available in 5m lengths all the way upto 15m lengths. One end has a hard eye spliced into it with a 16mm dia shackle so it easy to connect to. Hempex/Hardy Hemp or Polyhemp as it can be known was developed to allow the use of synthetic rope in situations that demanded a traditional look and feel. It is made from polypropylene and looks and feels very much like traditional hemp rope but with none of the disadvantages. It is popular for decking and gardening projects, hand rails and is suitable for children's play equipment. LED Rope lights provide instant decoration and can be used both indoors or outside. They can be used in so many places and settings. Rope lights are flexible and can be twisted to any desired shape. Rope lights look amazing outside, inside, along roof lines, around banisters, they can be used virtually anywhere. All our rope lights are produced to the highest quality and have a fuse-bulb structure which means that if a defective bulb goes off it will not affect the other bulbs in the series. Also all our PVC is made of top-graded materials which produces a crystal clear PVC with high flexibility, temperature sustainability and UV resistance. Our duplex polyester webbing lifting slings are textile slings that have soft eyes on each end of the sling. They are designed to bear heavy loads and lift them safely. Different colours are used for different working load limits for easy identification. Manila rope is made from a hard natural fibre. It has excellent resistance to sunlight, little stretch and good knot-holding ability. Manila rope must be stored dry to avoid mildrew, and chemicals will cause it to deteriorate. 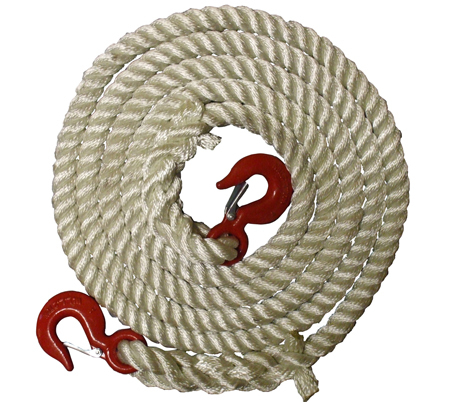 In this category you will find our range of mooring ropes sold in sets. We supply mooring ropes in white, navy blue and black in 3-strand construction rope such as nylon and polypropylene. They can be used in fresh or salt water and are available in 10mm, 12mm, 14mm & 16mm diameter. 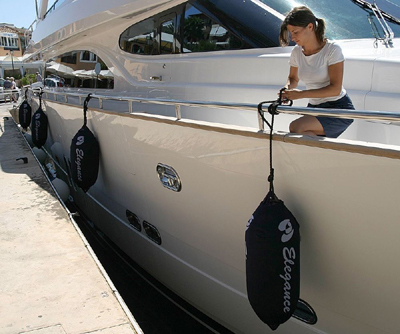 If you need custom made mooring ropes for your boat, why not give us a ring. 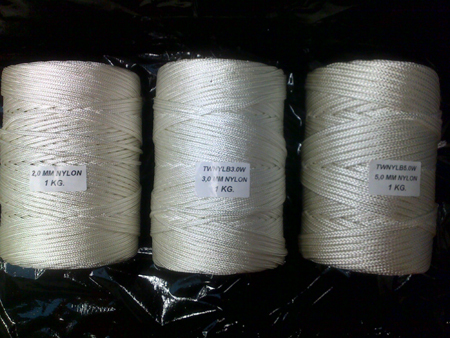 White & black 3 Strand nylon rope. Nylon is the strongest of all ropes in common use. When stretched it has a "memory" for returning to it's orginal length. For this reason it is the best rope for absorbing shock loads, as is the case when lifting or towing. Nylon lasts 4-5 times longer than natural fibre ropes because it has good abrasion resistance & is not damaged by oil or most chemicals. Like manila, nylon has excellent resistance to ultraviolet deterioration from sunlight, referred to as "U.V. stability". Braided nylon cord or twine that can be used in all kinds of applications. Supplied in 1kg spools in 2mm, 3mm, 4mm, 5mm & 6mm diameter in white, black, green, blue, red, yellow and purple. From lorry ropes to lashing ropes, the ideal category for carrying or holding down loads! High strength polyester braided cords in cross braided 8 plait construction for picture cords, blind cords and industrial applications. Available in the following dia 1.5mm, 2mm, 3mm, 3.5m, 4mm, 5mm & 6mm. Supplied on sturdy plastic reels for ease of use and storage. Available in white and black. This high strength heavy synthetic fiber is resistant to ultraviolet deterioration giving it greater weather resistance than either nylon or Manila fiber. Due to polyesters low water absorbency, only slight strength loss is experienced when wet. Polyester does not have the stretch and elasticity of nylon. Polyester is superior to nylon with respect to cycle loading and abrasion. Good for high friction uses like marine running, rigging and stringing line. Our braided polypropylene cord/twine is a 8 plait construction cord that is suitable for many uses including draw cords and draw strings. Relatively inexpensive compared to other ropes, polypropylene rope floats and absorbs very little water. When wet it is flexible and does not shrink. It's highly resistant to acids, alkalis and oils. What ever your need for twine, be it for packaging or just general use. We've got it here! All our twines come standard in a white colour. We can supply other colours, please email us for a quotation! 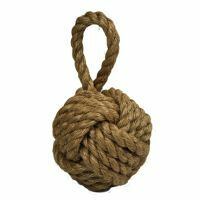 These weighted manila rope door stops are a unique addition to any home, beach hut or boat. They are handcrafted in house by our fender makers and are made from the highest quality grade 1 manila rope. Each ball uses approx 8m of rope in it's construction. Approx size is 50cm in circumference and they weigh approx 2kg. They are environmentally friendly, being made from natural renewable resources. Here is where you find all our items that are on sale. We have some fantastic offers on that will not be beaten. A rope thimble is used with rope when splicing the end of a rope to form a hard eye or loop that can be connected to shackles etc. 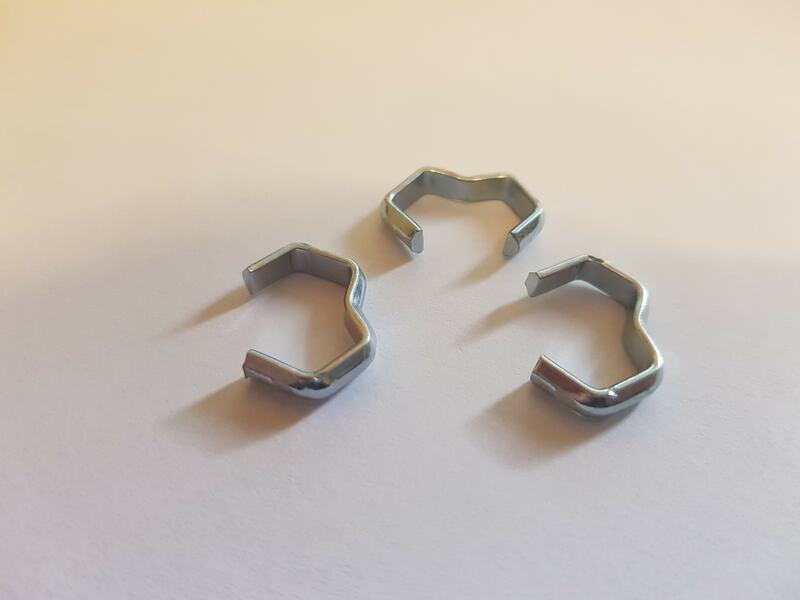 Usually a heart shaped piece of steel insert that is used to preserve the natural shape of the loop from pinching and abrasion. Available in commercial zinc plated (galvanised) or stainless steel. 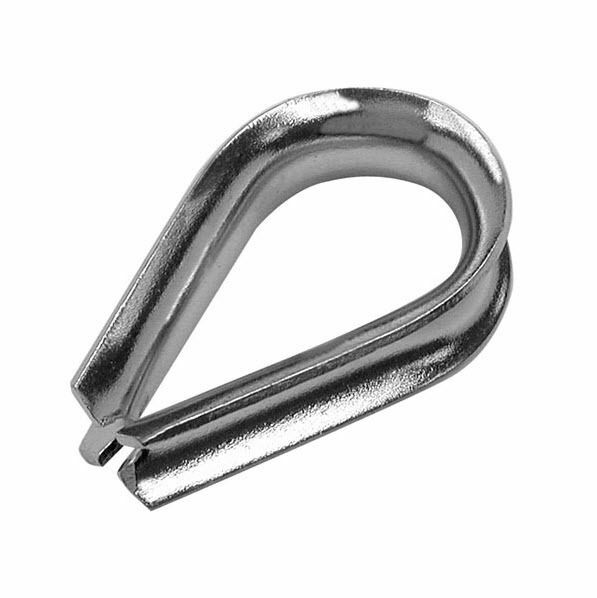 You can also use with galvanised wire rope where a length is required to be terminated into a hard eye. Selma Fids set (Needles) are made from highly polished stainless steel. They are patented Worldwide and each fid is embrossed with a manufacturers mark for authenticity. They are used for splicing doublebraids (braid-on-braid rope), 3-strand construction ropes & also hollowbraids ropes. They come in a protective case complete with detailed illustrated instructions. In this section you will find our shock/bungee cord fittings & accessories. We stock a huge range of fittings & accessories to accompany our shock/bungee elastic cord. From plastic coated metal hooks & autolocking plastic hooks to shock cord bungee straps. We have it all at the most competitive prices on the net. An entirely natural product manufactured from the fibres of the Agave, sisal twine/string is a very strong and versatile product. Stainless steel bungee cord hog rings. Available in 2 sizes, one size is suitable for 4mm-6mm bungee cord and the other size is for 8mm-10mm bungee cord. 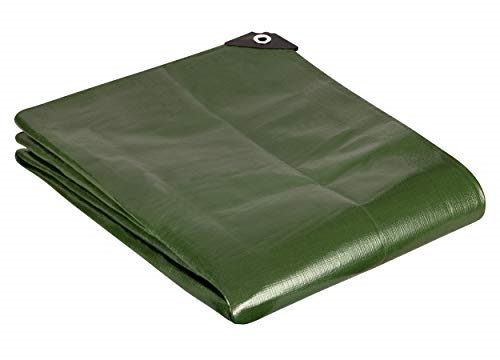 These green heavy duty tarps are a heavy weight polyethylene, with an approx weight of 180gsm. A tight 14 x 14 per sq inch weave count & chunky 12mm aluminium eyelets at 100cm intervals mean this tarpaulin is a tough cover which is more likely to stand up to the rigours of year round usage. Each corner is also fitted with a 3-rivet reinforcement patch. Popular as roofing covers, industrial covers, in agriculture, for groundsheets and boat tarps. Like all our tarpaulins the material is waterproof and flexible in sub zero temperatures. There is also a 3% UV inhibitor in the polyethylene to ensure the material does not degrade prematurely due to the effects of the sun. In this section you will find some great bargains on our tow ropes. 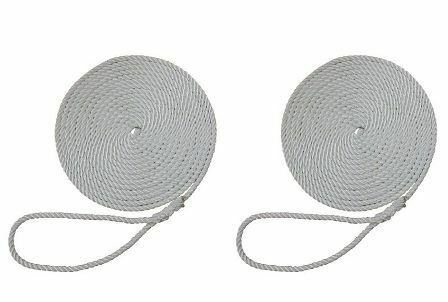 These are made out of 24mm nylon rope and are ideal for vehicle recovery and 4 x 4 off roading. We have 3 different tug of war ropes to choose from to suit everyones budget. The game Tug of War has been around for centuries, it is known that it had been practised in ancient Egypt & China and in local villages in Korea it was used to settle disputes for centuries. Our tug of war ropes are made out of high quality manila & sisal rope and are great for competitions or just messing around with your friends.